"I will make you into a great nation and I will bless you; I will make your name great, and you will be a blessing. I will bless those who bless you, and whoever curses you I will curse; and all peoples on earth will be blessed through you." I will make you very fruitful; I will make nations of you, and kings will come from you. I will establish my covenant as an everlasting covenant between me and you and your descendants after you for the generations to come, to be your God and the God of your descendants after you. The heart is deceitful above all thingsand beyond cure. Then Haman said to King Xerxes, "There is a certain people dispersed and scattered among the peoples in all the provinces of your kingdom whose customs are different from those of all other people and who do not obey the king's laws; it is not in the king's best interest to tolerate them. If it pleases the king, let a decree be issued to destroy them, and I will put ten thousand talents of silver into the royal treasury for the men who carry out this business." Centuries later these ideas were carried out in the mostly Protestant Germany. In November of 1938 one of the first large scale pogroms was established by the Nazis in honor of Luther’s birthday. The seeds of hatred for the Jews were especially evident in pre-W.W.II Germany. 1873 saw the first use of the term “anti-Semitism” by Wilhelm Marr. Before this the Jews were considered evil for what they believed. Now they were thought of as separate race, fundamentally different from “Aryans”, a fictitious super-race invented by the Nazis. In 1920 the book Protocols of the Elders of Zion was translated into German and sold 120,000 copies the first year. Even when it was shown to be a forgery and totally bogus it grew in popularity, with lectures and classes given on the “international Jewish conspiracy” posed by this book. Later in the 1920’s the worst inflation hit Germany. This was partly caused by Germany’s huge reparation bill from W.W.I. 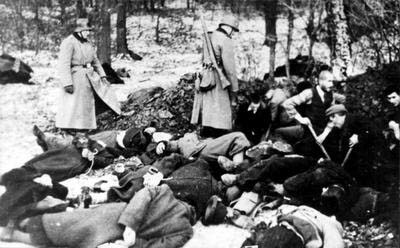 Germany’s loss was ironically blamed on the Jews, even though 100,000 fought in it, and 12,000 died for Germany. The money became worthless, unemployment was huge, there were food riots...and someone had to be blamed. Since the middle ages Jews were prohibited from many trades except for debt collection as a service to landowners. This tradition in finance led to them being targeted for all Germany’s financial woes, even though they were only 1% of the population. Paradoxically, while Jews were accused of being too successful as capitalists, they were also accused of being Communists, and thus enemies of Germany. Hitler’s Nazis rose to power on this platform...”the Jews are our misfortune!” Hitler’s cause of Jew hatred became intertwined with German nationalism to the level of a religion, with Hitler as god. The Nazi said: “In fighting off the Jew, I am fighting for the Lord’s work.” This new Nazi “religion” had its roots in the occult, which Hitler and his associates practiced. Under the guise of “protection” for Germany, laws and policies were established that slowly but persistently disenfranchised the Jews. Soon they were no longer citizens and had no rights. Many were expelled or were driven out. Towns would proudly boast to be “Judenrein”, cleansed of Jews. 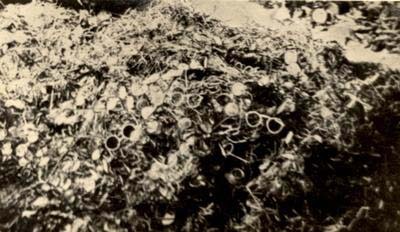 November 9, 1938, the “crystalnact”, night of broken glass, left no doubt about Germany’s attitude toward Jews: 190 synagogues were destroyed, along with 800 Jewish owned shops, 30,000 Jewish men were sent to concentration camps, and thousands were murdered. As a “bonus” for this treatment Jews were fined one billion reichmarks, about $400 million. When Germany invaded Poland in 1939 persecution of the Jews escalated. Warsaw, the center of European Jewry, was turned into a ghetto where up to 5,000 people a month died of disease, starvation and attacks by both the Germans and their eager accomplices. In 1941 Reinhard Heydrich organized the “final solution” to the “Jewish problem”; Jews were deported from all over Europe to death camps. In all, over 6 million Jews were murdered...a figure that cannot describe the toll in human suffering it represents. When the war ended the full horror of the “final solution” was revealed to the world. Holocaust comes from the Greek “holo”, whole, and “caustos”, burned; meaning entirely consumed by fire. Out of this fire God faithfully preserved a remnant of His people. But Zion said, "The LORD has forsaken me,the Lord has forgotten me." "Can a mother forget the baby at her breast and have no compassion on the child she has borne? Though she may forget, I will not forget you! The Israeli Knesset chose the 27th of Nisan, usually the beginning of May, as Yom Hashoah, a day to remember the Holocaust. It is uncertain why this date was chosen, but it is linked with the end of the Warsaw Ghetto Uprising, one of the few instances of organized armed confrontation of the Jewish victims with their persecutors. It also falls one week before the celebration of Israel’s Independence Day, symbolically linking it with the fall of the old European style Jew, and the birth of the modern Zionist, the strong, independent Sabra. If it is possible to say that anything good came from the Holocaust it is that world opinion showed some favor to the founding of a Jewish state, and that the Jewish people saw once and for all that no matter how well assimilated, no matter how indifferent to Zionism, they would only be safe in their own land, the land promised to them by God.